Shoshoni is the gateway to the Wind River Canyon. This canyon is a scenic byway of breathtaking views and storied geology. The area is also a rock hounder’s dreamscape and a fisherman’s playground. The total solar eclipse that swept across the nation in 2017 plunged Shoshoni into darkness and into the spotlight, especially when artist Eames Demetrios installed a permanent monument in honor of the celestial event in town. Discover petrified wood, agate, tourmaline, quartz, and even mercury in the landscape surrounding town. 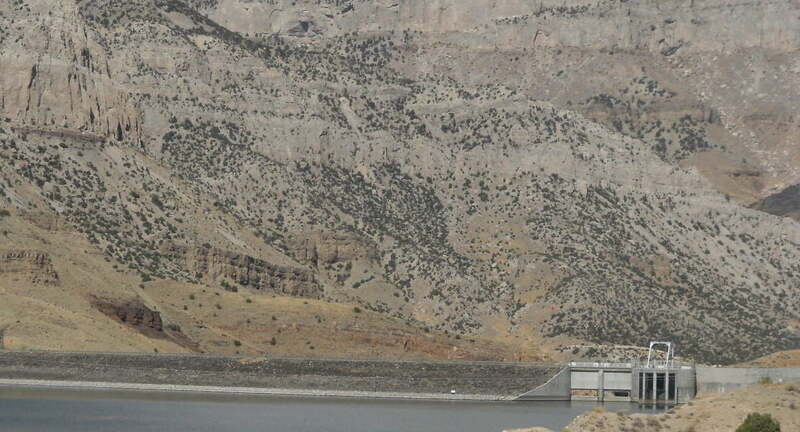 Or head to Boysen Reservoir and Boysen State Park for water sports and fishing. Hook walleye, sauger, perch, crappie, ling, largemouth bass, bluegill, stonecat, black bullhead, mountain whitefish, lake, brook, cutthroat and brown trout and splake, as well as several non-game species. Shoshoni hosts the Flywheelers Antique Engine and Tractor Show every June. In the summer of 1904, the Pioneer Townsite Company laid out the plat for Shoshoni. Shoshoni is an Native American word that translates to “little snow”. The first business to be erected in the town was the Elkhorn Hotel, built in September 1905. In less than a year, the town had become a tent city and had grown in population to approximately 2,000. Lack of building material in the very early days was a problem, since the railroad – Chicago and Northwestern – was 100 miles away, but the town gradually grew in size. Unfortunately, Shoshoni was devastated by fire in 1907 and 1908. During the reconstruction, brick buildings took the place of flammable wood. Five miles north of Shoshoni, a little burg named Bonneville was constructed on the CB&Q Railroad, which had been extended along the Badwater Creek. The town was almost totally destroyed by the flooding of Badwater Creek in 1923. Twenty miles of railroad track, several rail cars and one motor car were never recovered from the flood. They remain buried deep in the sandy mud of Badwater Creek. During its boom days Shoshoni boasted 23 saloons, two banks, two large mercantile establishments, several livery and feed stables, a lumber yard, drug store, two physicians, several lawyers, a newspaper and more lodging houses and restaurants than any town of equal size in the state of Wyoming. Thirteen miles to the north is Copper Mountain. It is dotted with old abandoned mines and prospector diggings. Copper was the most abundant, but gold and silver were also found, along with chalcocite, malachite, axurite, cuprite,lepidolite, chryscolla, calcopryritre, dolomite, feldspar, garnet, magnesium, tungsten, volcanic ash and pumic. Uranium can also be found on Copper Mountain.